The granddaddy of science fiction films is screening for one night only. Without Fritz Lang’s influential Metropolis (1927), the cityscape of Blade Runner (1982) would be uninspiring, C3PO would be naked, and Queen’s Radio Gaga would lack a video clip. This German Expressionist masterpiece is screening, free, at the Northbridge Piazza on April 13. As an added bonus you can experience it in the same way that audiences of the time would have experienced it – with a live score, provided by Peter Pichler on the trautonium in Pichler’s Trautonium vs Metropolis Live. The trautonium, invented in Weimar Germany in 1929, is the great-grandfather of the synthesizer. The eerie sound it produces has featured in films, most notably used for the bird sounds in Hitchcock’s thriller The Birds (1963). The pairing of Metropolis with the soundtrack of the trautonium is an intriguing combination that gives viewers a unique look at the way the future was imagined by these cultural products of the past. Both film and instrument were incredibly progressive at the time and are, in our current era, more relevant than ever. Electronic music lovers, film buffs and inventors alike will be fascinated by this incredible concert. This is the first time the trautonium has toured outside of Europe. With a beloved classic of the science fiction genre, and distinctive instrument, Peter Pichler’s Trautonium vs Metropolis Live promises to be a unique free film and music event and a retro-futurist’s delight. 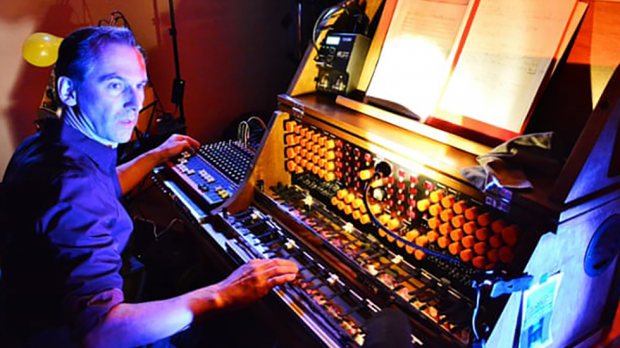 Peter Pichler’s Trautonium vs Metropolis Live is at the Northbridge Piazza, Saturday April 13 at 7:30pm. It is a free event, and no booking is required.